﻿It's that SPRING HOLIDAY time of year again! 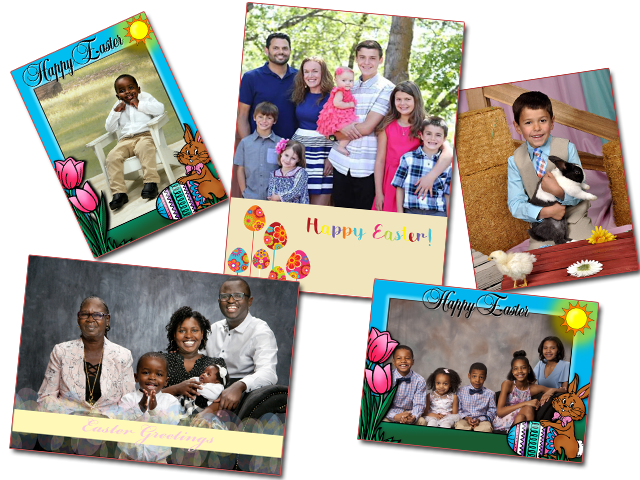 It's time to gather up the entire family and take those yearly Spring (Easter, Passover or Mother's Day) Holiday theme portraits for family & friends. Our Spring Holiday Portrait Collections are designed for major Holidays such as Easter, Passover and Mothers Day. ﻿This offering contains three Collections, including the Mountain Top Collection, the Holiday Wall Portrait Collection and the Holiday Gift Portrait Collection, ranging in price from $145 to $1095. All include 25 festive Holiday Cards and Envelopes... a convenient way to keep distant friends & family updated on important changes within your family. We have new Spring-theme Studio Backgrounds & Backdrops, too. Extra copies of the Special Holiday Greeting Cards as well as envelopes are available for order. ﻿Click here to schedule your Portrait Session! Our staff of graphically trained experts use the worlds most powerful digital photo editing software to professionally edit each picture selected for print, so that you and every family member looks their very best.